The History and Adventure Tour starts at 10:30 by pick-up from your hotel. After a 5 minute drive we will start our hike in the beautiful Rose Valley which will take slightly more than one hour. We will see fairy-chimneys, local farms, pigeon houses and cave chapels – as well as take in the wonderful range of rose-colored hues in the valley, changing in intensity depending on the season, time of day and weather conditions. 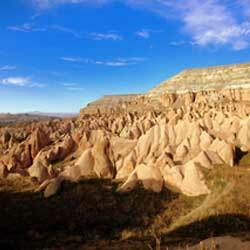 Your guide will give information about the history and the unique formations of Cappadocia during the hike. At the end of the hike, we will have a quick stop at the picturesque old Cavusin Cave Village. Our next stop will be Monks Valley (Pasabag), where we will see the mushroom-shaped fairy chimneys and St. Simeon’s monk cell. Then, we will drive to Goreme for the lunch. In the afternoon, we tour the Kaymakli Underground City after about 30 minute drive, the first and most popular underground city in Cappadocia. 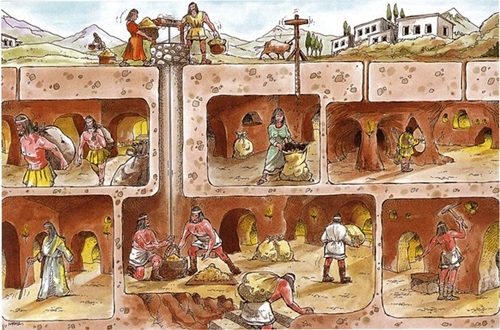 This complex carved underground was used for hundreds of years by local people to hide from Romans, Persians and Arabas.